Wrong are those who say that UCSD students do not have a distinct fashion style. After all, we are the only ones to rock blue and yellow UCSD sweatshirts. 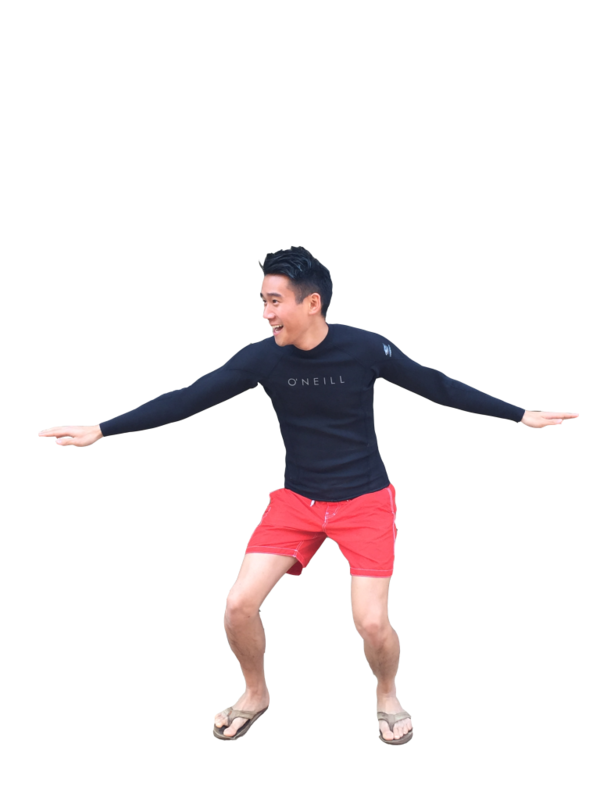 From school pride infused merchandise, classic wetsuits and flipflops, the Guardian uncovers the typical closet of the UCSD student — with all classic looks modeled by our one and only editor and chief, Vincent Pham. New York has Lincoln Center, Paris has Carrousel du Louvre and UCSD has Library Walk. No need to drop thousands for a upscale show when a cement block gives a VIP view to the best up-and-coming trends UCSD has to offer. Just as Diane von Furstenberg iconicized the wrap dress, Herve Leger the bandage dress and Miley Cyrus the teddy bear onesie, UCSD students have curated their own statement look that treads the fine line between being just homogeneous enough to subtly nod towards a corporate suffering under the wrath of Chem 6A and MMW 14, while touching a level of versatility that accommodates gender inclusivity and the slightest of idiosyncrasies. So what’s trending? 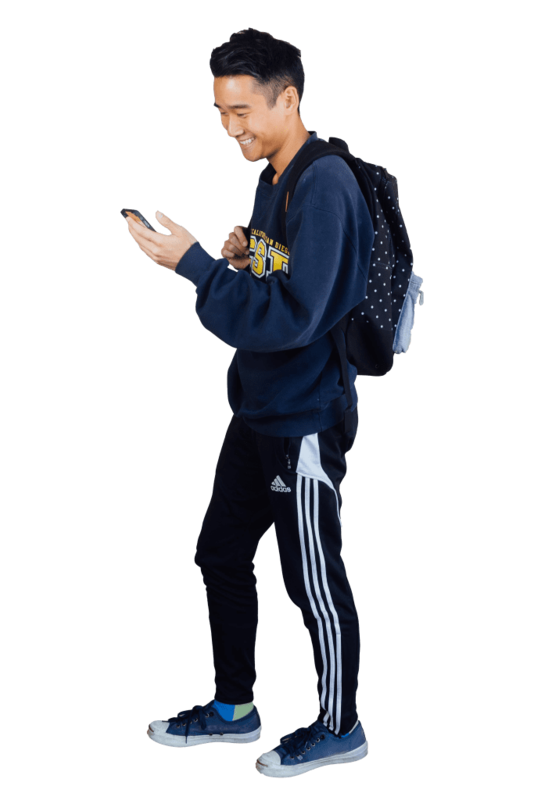 A must-have is the traditional UCSD sweater — whether crew-neck or hoodie, gray or navy blue, with or sans zipper, put that Triton Cash to use and fund university pride. Pair this cotton classic with a very limited choice between either soccer pants or leggings; and for footwear, nothing quite says “I need to make it from Pepper Canyon to HSS in ten minutes” like a pair of Nike Frees. To carry all the essentials — including a Hydro Flask bottle — invest in a Herschel, but always keep everything monochromatic. No one wants to be the student whose lemon yellow backpack blinds half the population on their way to an 8 a.m. class. As week 10 comes to a close, students bloom into their finals week personae, complete with a gloriously unhygienic ensemble fit for the Library Walk runway to Geisel. The classic statement pieces? Gucci eye bags in the shade charcoal. These never fail to go out of style year after year, final after final. The coffee- and pizza-stained shirt — a seasonal item — is a comfortable go-to, but also provides insight into the diet of the sleep-deprived student (coupled with the aromatic cup of freshly brewed coffee in hand — and let’s not forget the iced coffee reserves in the fridge). And if their caffeine supply is depleted, fluffy socks and sandals help keep these poor souls warm as they make the trek to the nearest market or Starbucks to hunt for food (i.e. more pizza) and replenish the energy drink stockpile. To complete the look, tiffany blue books and scantrons are necessary accessories for the finals week plight. 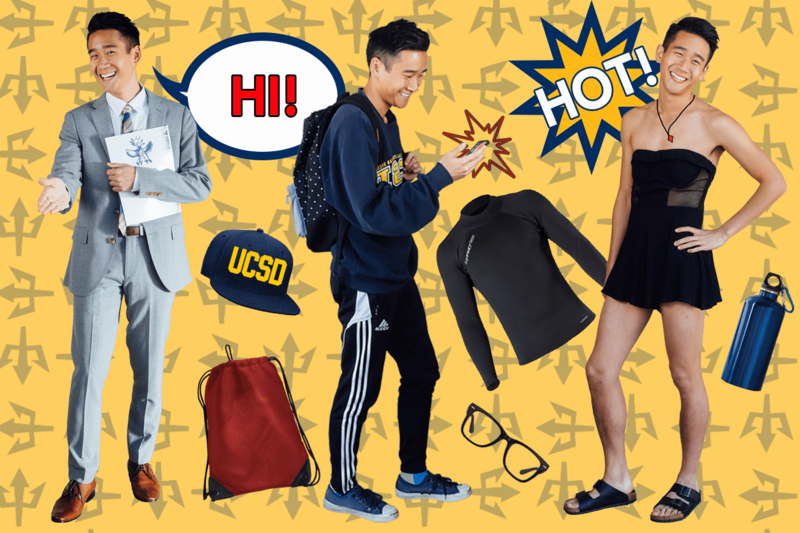 Unlike in some other universities where Friday attire must serve as a blatant representation of your family’s yearly income, it is hard to underdress for a night out at UCSD. The casual character of the majority of local events, coupled with the subtropical climate of San Diego, allows party attendees to cover as little of their bodies as possible. Short skirts and bandeaus, muscle tees and jeans for girls, boys and other folks, are a UCSD student’s fashion statement that screams, “I am done with midterms and ready to stay up all night to have fun.” These items are also a truly pragmatic choice — the less you wear, the slimmer your chance of spilling a drink on your clothes, meaning you will not have to feel like a clumsy five-year-old and deal with a line of furious individuals waiting for you to finish washing off the stain of shame in the bathroom. Equally important is the fact that a comfortable, sleeveless outfit frees you from the fear of ripping your favorite chic item while doing a presidential candidate-level dab. Isn’t it how you really should dress to impress? Attending a school so close to the beach makes it easy, natural even, to adopt the surfer lifestyle. Only two style components are required to fully embrace the surfer identity: a wetsuit and surfboard. Before hitting the waters, surf the Internet first for a cheap surfboard. There are pieces better off thrifted, with Craigslist as the Goodwill of surfboards. Used wetsuits are not as promising, considering the limited lifespan of some lower-end suits (and think of how the original user may have peed in their wetsuit — no one wants that). If you’re not yet confident enough to the waves, listen to Beyonce’s “Drunk in Love,” fill up your tub half-way and ride it with your surfboard (surfboard, surfboard). And if you’re feeling a little more brave and liberated, hit up Black’s Beach in your birthday suit and thrifted surfboard. Chances are, if you’re not from the East Coast, Russia or any place currently not facing a drought that could eliminate the entire carrot industry, the smallest of sprinkles might as well be torrential downpour. So when SoCal starts to rain — otherwise known to non-California natives as morning dew — the UCSD student go-to is nearly universal, and in itself, the most absurd of paradoxes. Once gray clouds appear, almost instantaneously, waterproof North Face jackets and beanies come out of hiding, accompanying, of course, the staple UCSD hoodie or, to spice things up, the occasional flannel with a built-in hood. But let’s take a moment and recognize that even during the worst El Nino has brought to sunny San Diego, there are still many that solemnly swear to wearing Rainbows through rain or shine. Perhaps this utter juxtaposition is to resemble a poetic notion that as San Diegans, there is an unspoken duty to boycott all closed-toe shoes; either that, or every stock photo ever reproduced in UCSD promotion packets have been perpetuating lies that all we need to survive here are a pair of $50 flip-flops. Sometimes we forget they exist and sometimes we prefer to ignore them to avoid feeling inferior, but they are among us — the People in Black are always on the mission. Their classic blazers, white button-ups, slacks, ties and glasses may trick you into thinking that they are just average office workers, but these gentlefolks are not here to obey and follow the rules — at least, not yet. Ready to slay their competitors with skills, past experience, expertise and personal interests, the people we are talking about are job fair attendants. With only three career fair events per quarter, they are a rare and unique phenomenon. Unlike other students, job fair attendants don’t carry backpacks and handbags — their only weapon easily fits in one hand. 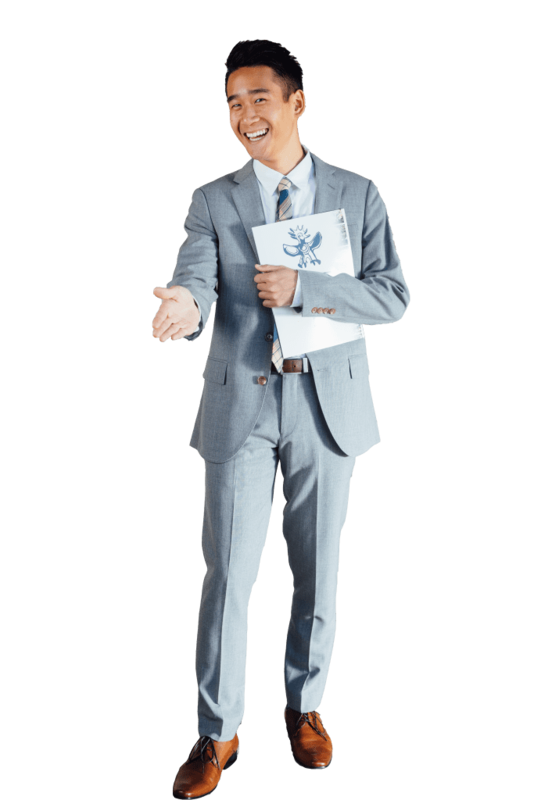 Capable of affecting memory just as well as a neuralyzer, a one-sheet resume is all a job fair attendant needs to make an employer remember them for a minute, day, week or until the interview opportunity. Calm on the outside, eager on the inside, these individuals are trained to wait in ambush for hours — career fair lines have never been short. That being said, just like a regular NYPD officer James Darrell Edwards III turned Agent J, you can easily turn into a job fair attendant. Just dress up in your best “buis-cas,” print out a copy of your CV and arm yourself with patience.